Riverflow, from Katsuma Tanaka, makes using keyboard shortcuts, as well as opening URLs and apps or running scripts, easier by letting you set custom two-finger trackpad gestures to quickly perform actions on your Mac. This can be applied globally, in addition to the scroll and zoom options already built into OS X, or specifically for certain apps. You can download Riverflow (Version 1.0.0) for free either from this direct link or their website on your Mac, although you'll need Mac OS X 10.10 (Yosemite) or later for it to work. Unzip the file and move Riverflow to your Applications folder for safe keeping. Once you open it, you can cycle through a short tutorial that shows you how to set up and use the two-finger gestures. After that, you can begin creating your own. 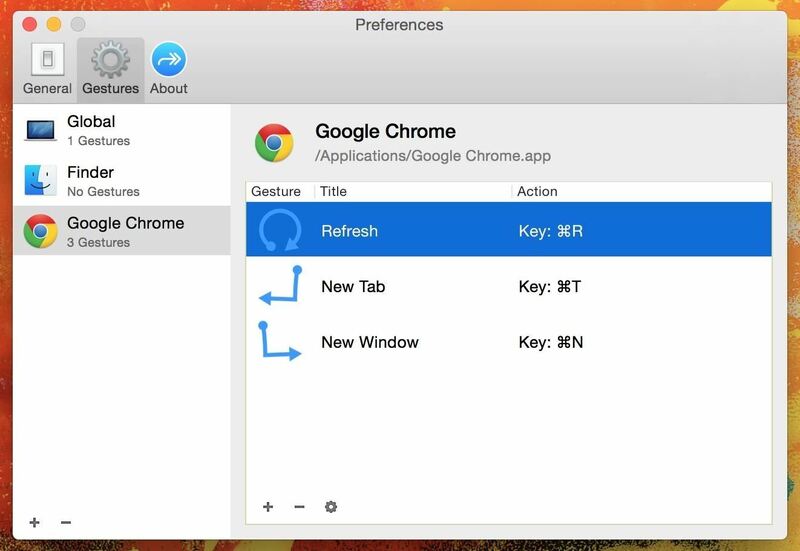 Select the app's icon from the menu bar and select "Preferences" to get started, then go to the Gestures tab. 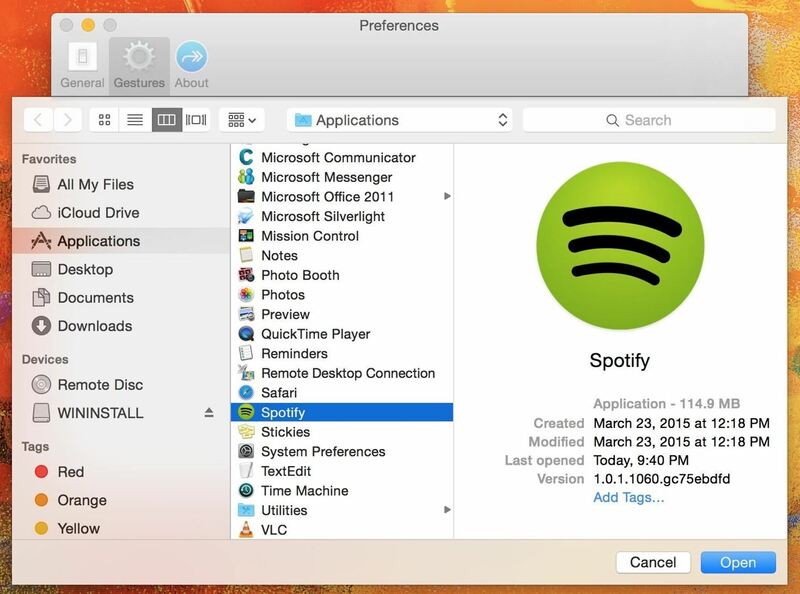 You can initially choose to create gestures that work across your entire computer (Global) or in Finder. Note: If you create a gesture for Global, it will override any gestures you've made for any other individual apps. Add a new gesture with the plus sign at the bottom left, then choose to add any app on your computer. 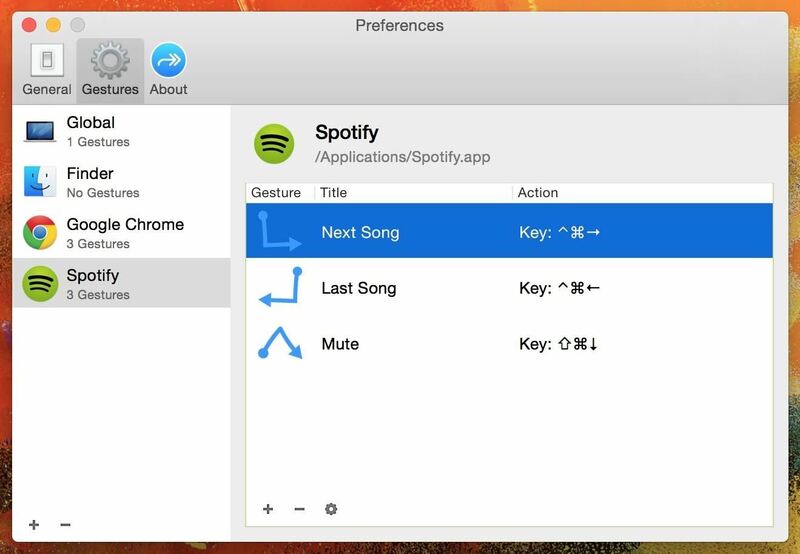 From my list of apps, I chose to add to gestures to Spotify in order to better control music playback. Once you have an app selected, hit the plus sign on the inside window to add a gesture for it. Click on the gesture icon to bring up all of the options (which require two fingers), including ones that swipe down and left or right, right angles, zig-zag, and create a circle. 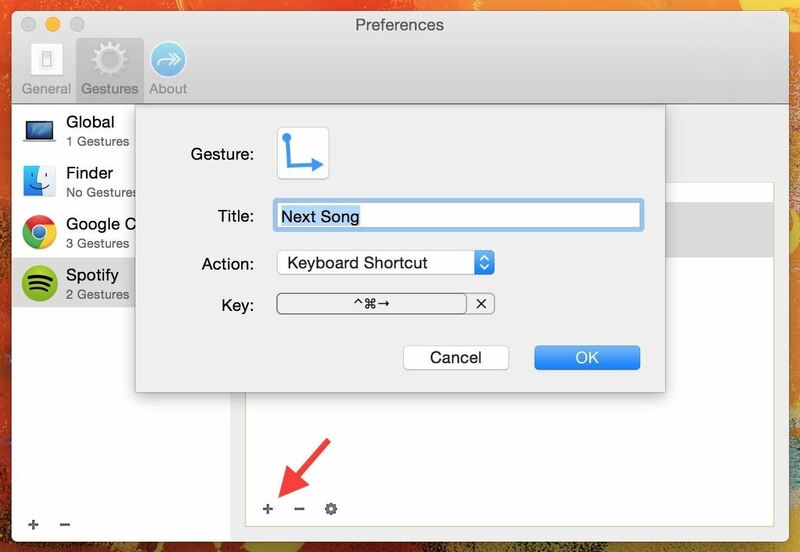 Once the gesture is selected, add a title to the shortcut, select the type of action (keyboard shortcut, open URL or file, or even run Apple or shell script) and enter the keyboard shortcut (or file or command) that you want to come about. 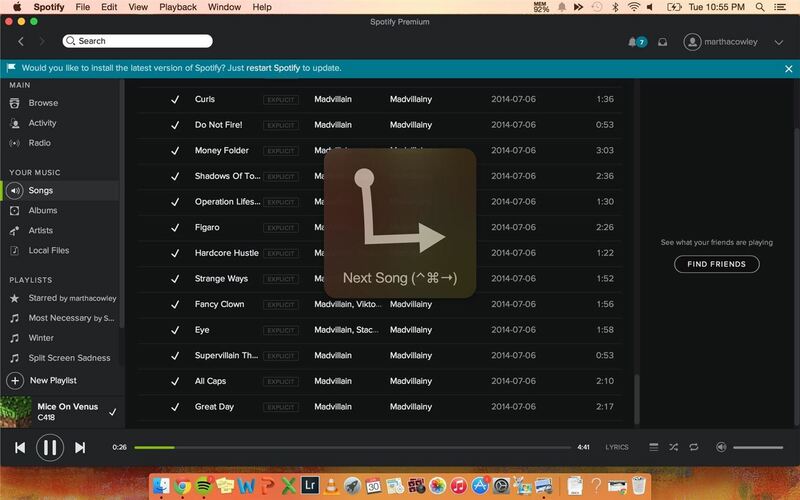 For Spotify, I created two-finger gestures for skipping a song, going back a song, and muting the song currently playing. In the second screenshot below, you can see the transparent window that appears in the middle of the screen when you successfully use a gesture. If you're not familiar with the keyboard shortcuts for some of your favorite apps, check out ones for Chrome, Safari, Spotify, and Photoshop. If you're trying to figure out any other ones, you can easily look them up on Google, through the app's help guide, or using CheatSheet. 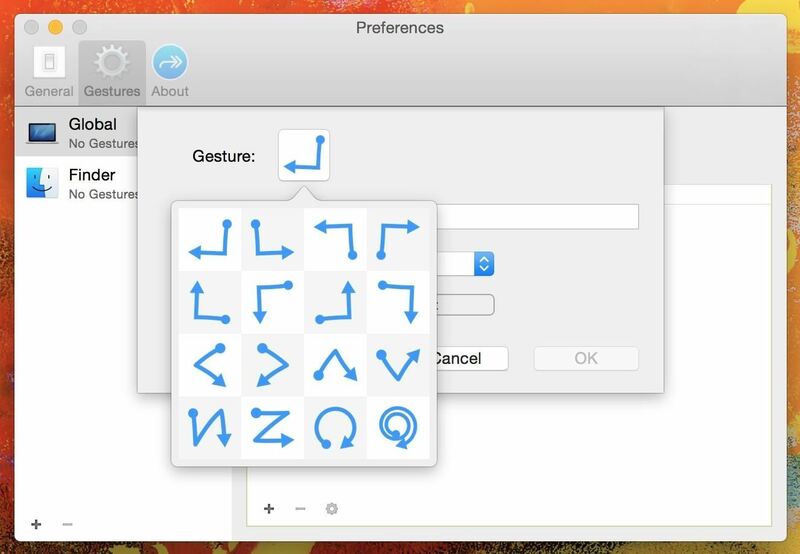 Give Riverflow a go and let us know how you use these gestures in your favorite apps in the comments below!